University town in the Prussian province of Saxony. Jews settled there soon after the city was founded, in the beginning of the twelfth century, the wealthy members of the community having business relations with the nobility in the vicinity. The Jews, who were at first subject to the archiepiscopal court and then to the mayor, lived in a quarter of their own, called the "Judendorf," and had a synagogue and cemetery. Like their coreligionists in other parts of Germany, they were repeatedly plundered and persecuted. It is doubtful whether they suffered much up to the time of the Second Crusade (1145), but they certainly did in 1206, 1261, 1349, and 1492. Several times, as in 1314 and 1446, they had to leave their homes, and in 1493 they were peremptorily expelled by Archbishop Ernst. Two centuries later a new community was formed, the authorities permitting some exiled families from Halberstadt to settle at Halle in 1692. They laid out a cemetery in 1693, and built a synagogue in 1700. They were still subjected to medieval restrictions: they were forbidden to acquire real estate or to attend the university, and their commerce was limited by special laws. The general privilege granted by Frederick William I. of Prussia, dated Feb. 26, 1704, regulated their civic status; yet in 1724 the synagogue and houses of the Halle Jews were demolished during a conflict with the students, and special taxes were laid upon them during the Seven Years' war. The Westphalian government granted full citizenship to the Jews in a royal decree of 1808, by which the body-tax, the protection money, and other extra taxes were abolished. When Halle came again under Prussian rule, the Jewish community of the town included about 150 persons. By the law of July 23, 1847, separating the Jews into synagogal districts, some neighboring communities were affiliated with the community of Halle, for which a representative constitution was drawn up. The first rabbi, Dr. Fröhlich, was installed in 1860. In 1864 a new cemetery was laid out and a new synagogue was built, to which an organ was added in 1900. The school, attended by 130 children (1903), is under the direction of the local rabbi, Dr. Fessler. There are a ḥebra ḳaddisha, a women's society, a "Rat und Tat" society (for the relief of business men in distress), a B'nai B'rith lodge, etc. Halle has (1903) a population of 156,624, including 1,300 Jews. Freudenthal, Aus der Heimat Moses Mendelssohns, pp. 175 et seq., 246 et seq. (on Hebrew printing establishments in Halle). Moses Benjamin Wulff, court Jew at Dessau, obtained in 1694 a privilege from the Prince of Dessau to establish a printing-office in that city. He began to publish books in 1696, but financial difficulties compelled him to abandon the business. One of his typesetters, the proselyte Moses ben Abraham, was called to Halle in 1706 to assist J. H. Michaelis in the printing of the Bible. The citizens protested against the presence among them of a Jew without a royal letter of protection, and the king sustained their objection. 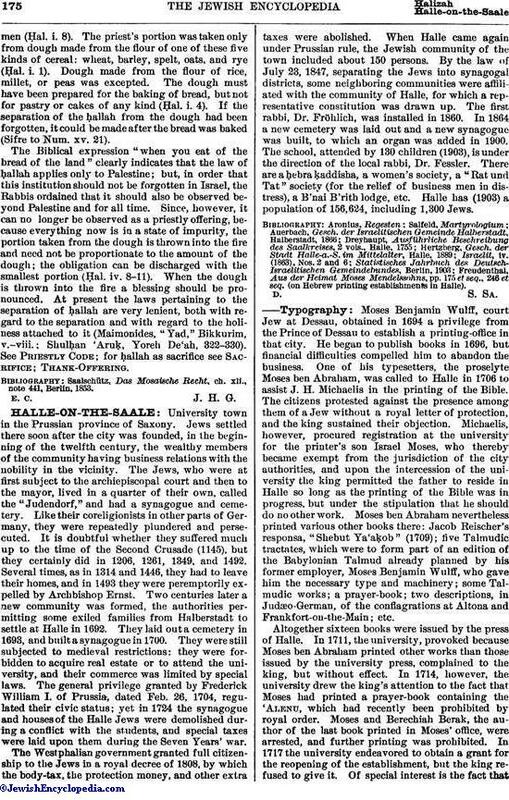 Michaelis, however, procured registration at the university for the printer's son Israel Moses, who thereby became exempt from the jurisdiction of the city authorities, and upon the intercession of the university the king permitted the father to reside in Halle so long as the printing of the Bible was in progress, but under the stipulation that he should do no other work. Moses ben Abraham nevertheless printed various other books there: Jacob Reischer's responsa, "Shebut Ya'aḳob" (1709); five Talmudic tractates, which were to form part of an edition of the Babylonian Talmud already planned by his former employer, Moses Benjamin Wulff, who gave him the necessary type and machinery; some Talmudic works; a Prayer-book; two descriptions, in Judæo-German, of the conflagrations at Altona and Frankfort-on-the-Main; etc. 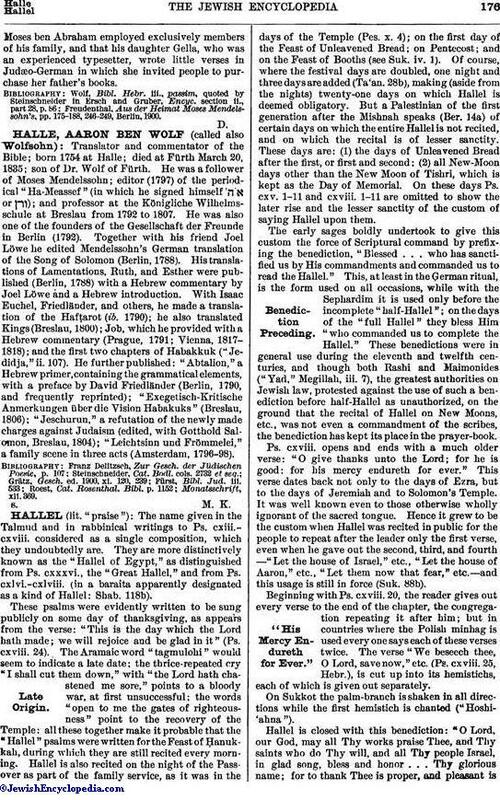 Altogether sixteen books were issued by the press of Halle. In 1711, the university, provoked because Moses ben Abraham printed other works than those issued by the university press, complained to the king, but without effect. In 1714, however, the university drew the king's attention to the fact that Moses had printed a prayer-book containing the 'Alenu, which had recently been prohibited by royal order. Moses and Berechiah Berak, the author of the last book printed in Moses' office, were arrested, and further printing was prohibited. In 1717 the university endeavored to obtain a grant for the reopening of the establishment, but the king refused to give it. Of special interest is the fact thatMoses ben Abraham employed exclusively members of his family, and that his daughter Gella, who was an experienced typesetter, wrote little verses in Judæo-German in which she invited people to purchase her father's books. Freudenthal, Aus der Heimat Moses Mendelssohn's, pp. 175-188, 246-249, Berlin, 1900.